Congratulations to Amanda! Her entry was selected as the winner of the 4-pk of tickets to Cedar Point HalloWeekends. Stay tuned for more giveaways coming this weekend. I come from a large family. My grandparents were an important part of my life and I enjoyed listening to the stories that Grandma would share. 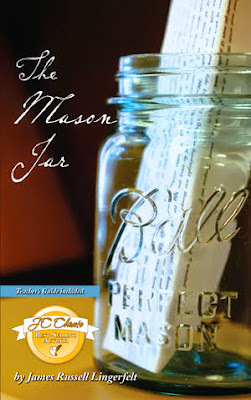 When I read the blurb about The Mason Jar and the letters that Finn and his grandpa would leave for each other, I decided it was a book that I was interested in reading. The style of the book is different than others that I have read in that the story starts in the present day and the back story is told through a book. Finn and Eden met at a college in Southern California. Though they only spent a little time together, the impact on Finn was large. So much so that years later, he wrote a book that focused on their time together and her impact after she left. Her college roommate made her aware of the book and once she had the book, she read it straight through. There were times where the heavy conversation of the book made it a little challenging to read, but I enjoyed reading the love story told through the man's point of view (and by a male author). In the context of the book in the book, we learned a lot about Finn and his perspective on the relationship. I enjoyed reading the perspective that Finn's grandfather was able to provide to him as a mentor, through the letters that they exchanged. It was nice that at the end of the story, at Homecoming, when they saw each other for the first time since she had left, that we learned more about her and why she left all of those years ago. If you are looking for a different love story, this is a good book to check out.